MGallery celebrates the revival of a beautiful heritage property as Queens Hotel, Cheltenham becomes a stunning addition this September to the Collection’s UK establishments. At the heart of every MGallery property is a story waiting to be shared. Strong personalities and great histories are elegantly expressed though each hotel’s unique identity, their story unfolding through eclectic details, timeless touches and elegant designs. Each hotel within the beautiful MGallery Collection offer guests a stay full of discovery and unique experiences. 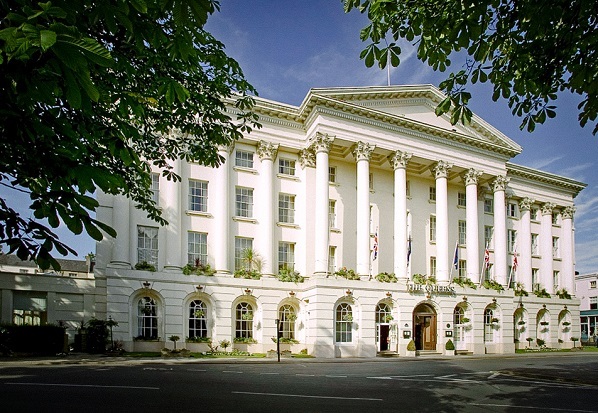 Queens Hotel Cheltenham encapsulates the character, heritage and grandeur of its impressive neo-classical architecture and incredible history and truly reflects MGallery’s ethos. The hotel was originally completed in 1838 on the site of the Sherborne spa, after it was moved stone by stone, further down the Promenade. Named in honour of the sovereign, the hotel first opened on the 21st July 1838, the year of Queen Victoria’s coronation. It was later listed as a Grade II English Heritage building in acknowledgment of its opulent design and stunning details. As is true of every stunning MGallery property, Queens Hotel has a strong and unique personality, truly reflected through carefully crafted décor and the loving and loyal restoration of timeless details. The hotel is truly a place filled with history. Remarkable listed features harmoniously blend with contemporary touches, elegantly reviving the hotel’s heritage. In the lobby, guests are drawn to intimate seating areas rather than a formal desk and a stunning tiled floor gracefully balances the high ceiling. Listed wallpaper designed by the infamous Pugin, famed also for designing the interior of the Palace of Westminster, lines the walls of the iconic and beautifully preserved staircase which invites guests to discover the hotel’s opulent heritage features. The staircase leads visitors to elegant guestrooms, which include twenty eight stylish Superior Rooms and four exquisite Suites. Nobly grounded in the heart of the Regency Spa town, Queens Hotel is also a heritage destination by its location. Queens Hotel is neighboured by a collection of beautifully preserved Regency buildings and sits prominently overlooking the groomed Imperial Square Gardens and Cheltenham Town Hall, home of many of the town’s festivals. Imposing style and finesse, the hotel has welcomed guests as impressive and distinguished as its own history. who spent five weeks in Cheltenham to drink its medicinal waters. The emblematic heritage building has been an integral part of Cheltenham’s history since the 1800s; a grand Dame whose simplicity elegantly complements her imposing majesty. Today the unique story of Queens Hotel will be unravelled carefully by guests throughout their stay. As soon as they walk through her grand doors, guests will be at ease; impressed, thrilled but never intimidated by the splendour of her heritage. An elegant and timeless property, the hotel is the perfect destination for visitors to the historic spa town, offering a quintessentially British experience built on grandeur and a spectacular history.